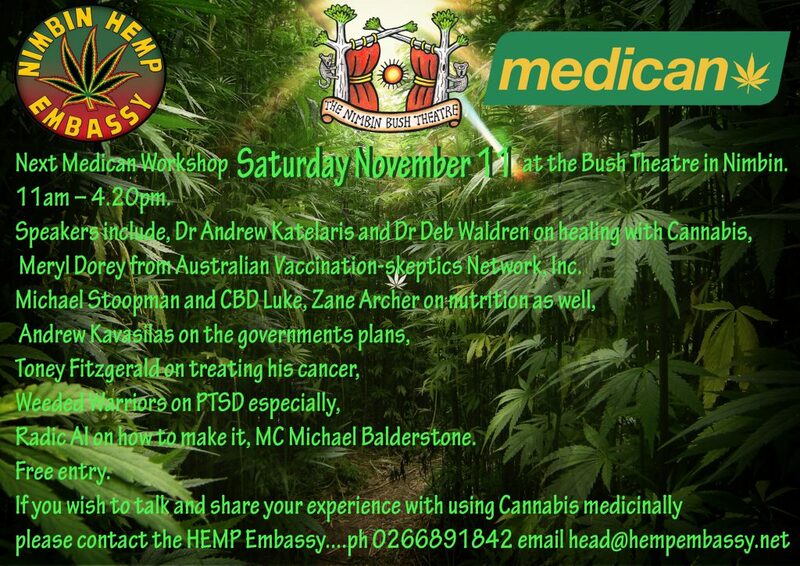 Drs Andrew Katelaris and Deb Waldren will be there as well as many other healers and people who are using Cannabis to treat themselves. Be it epilepsy or cancer or Parkinsons it is super encouraging for sufferers to meet and talk to others with similar conditions. Meryl Dorey is a special guest speaker this time. She has been an outspoken sceptic about Australia’s immunisation program and many of us have met children using cannabis after they started having seizures following their needles. CBD Luke will be here again to teach us more about that specific cannabinoid and Radic Al will be teaching extraction methods. The Phoenix Rising Cafe will be open early for breakfast by Mulgum Creek at the venue. The medical cannabis movement has been ridiculed for a long time, like many other Nimbinesque ideas. Finally the evidence is appearing that shows hippies weren’t deluded after all! Anyone is welcome to this day of talks and discussion and entry is by donation only.